The Elharim has appetites even the Khurtic warriors cannot keep up with. Amon Tugha readies to dispatch his best warriors against the city where Queen Janessa watches her enemies. Her city burns and a horde waits just beyond, ready to destroy her and all she stands for. For six days the Khurtas have sat outside Steelhaven and not made any move to attack, but Waylian Grimm is sure they are there for a reason. He and his mistress now have the Archmasters on their side, but will that be enough? Kaira has not been a Shieldmaiden for some time now, but her old life and its burdens are not forgotten. She has a new charge, and like the old she will pursue it to the end. Burdens from the past also weigh heavy on Nobul Jacks. He has taken up his old arms and his old name, and will once again face demons with steel. 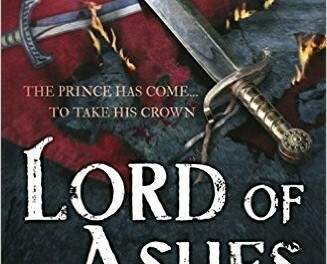 This third book in Ford’s Steelhaven series brings many threads of the story to a close, although this looks to be in no way the last Steelhaven instalment. Lord of Ashes places fairly equal focus on the main characters throughout, allowing all of them to take centre stage at the appropriate time to finish their journeys and the book also reveals some more detail about Amon Tugha and his followers. Like the previous books the worldbuilding, pace and descriptive action are all handled well, making this as easily read as its predecessors. The ending is a little unexpected, with the narrative not coming to a clean closure, so this now firmly feels like an ongoing series and not a trilogy as we automatically come to expect with fantasy. 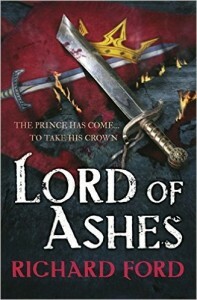 Lord of Ashes could have benefited from more of a plot recap to ground the reader back in this world and events gone by, but the characters are memorable enough to keep things moving and although the ending felt a little rushed I suspect it will not be long before we are back in Steelhaven for more.